The earliest cars had almost no safety features. They couldn’t go very fast – 20 mph, tops – but even at these low speeds, a crash could be deadly. The cars of the 1940s and 50s were big and heavy. Their heft made them a little safer, but they still lacked seat belts. Car accidents have long been one of the most common causes of early death. Edward J. Claghorn patented a seat belt for New York taxis in 1885. During the 1930s, American doctors began urging car makers to add seat belts to cars. Race car drivers were the only ones who used them. The first modern three-point seat belts were invented by Nils Bohlin, an engineer for Volvo in 1959. The company became known for its interest in producing safe cars – a reputation that lingers today. Upon Bohlin’s death in 2002, Volvo estimated that more than 1 million lives had been saved by his invention. Volvo could have patented the seat belts so other companies couldn’t use them. Company executives believed that safe cars should be available to everyone whether they bought a Volvo or not. They chose not to patent the invention and other car makers began using them. Car makers began regularly including seat belts in their car designs. Unfortunately, most people didn’t wear them. 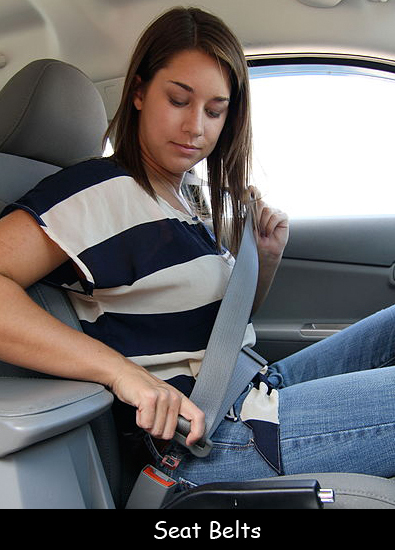 Governments produced television commercials and billboards encouraging seat belt use. Most people believed the government didn’t have the right to tell them what to do in their own cars. In 1969, Czechoslovakia became the first country to mandate seat belt use. In 1983, Britain mandated seat belt use. The U.S. government allowed individual states to decide whether wearing a seat belt should be the law. Today, all 50 states have seat belt laws. In most states, you can be pulled over and ticketed for not wearing a seat belt. Question: Is it really that important to wear a seat belt? Answer: According to the Centers for Disease Control, wearing a seat belt (or sitting in a car seat) is the single best thing you can do to prevent serious injury in a crash. In 2014, 59 percent of people killed in car accidents were not restrained. The moral of the story: buckle up! Download a graphic that shows seat belt data for your state.